Because everyone will be touched by dementia, whether it’s a relative, a friend or someone in your community. Be part of the solution. Join the movement and make a difference for people impacted by Alzheimer’s. Canadians are living longer and age is the biggest risk factor for Alzheimer’s disease and other dementias. Did you know that more than half a million Canadians already have dementia? In less than 15 years that number will nearly double to 937,000. We still don’t understand the causes and we have yet to find a cure. Memories make us who we are. 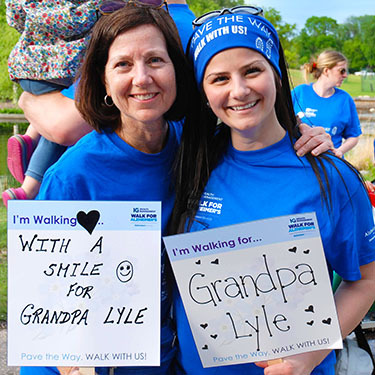 When you walk, you honour those who have passed and support our work to help people who have dementia now, live well. Across the country, Alzheimer Societies offer programs and services that can help individuals and families touched by dementia in many different ways. IG Wealth Management Walk for Alzheimer’s is not only a great opportunity for communities to rally around this increasingly prevalent disease, but a fun way to raise awareness and much-needed funds that can make a world of difference in the lives of Canadians affected. Be part of our movement towards a world without Alzheimer’s disease.